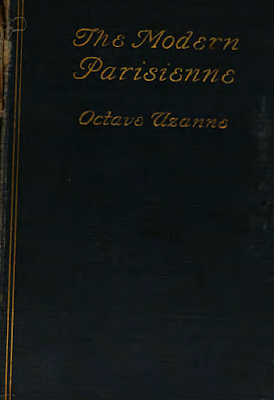 Octave Uzanne dropped out of law school at 21 and immediately fell in with Paris' bibliophile crowd. A fan of George Eliot and the Goncourt brothers, he pioneered new techniques in typography and printing, warning against a future shift to cotton papers. 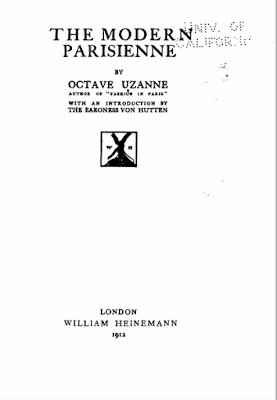 "Even in the atmosphere of Paris, Uzanne may be mistaken for an Indian prince," the New York Times wrote. "His eyebrows almost meet, his eyes have flashes of steel, his resolute chin is hidden under a curly beard, and his hair is thick, brilliant, black, and wavy. One may divine that he has the air of his style, the phrases of which are string of pearls, of rubies, of sapphires, and chrysolites." Mentally I picture him making his investigations, sly M. Uzanne, talking with grave courtesy to these ladies. He must have loved writing the exquisite little monographs, as one loves reading them. Each is a jewel in itself. Does not one long to know the fried-potato woman, seriously suspected of employing in her art dog's fat instead of lard? And the demure dame of a certain age who sells newspapers in a kiosk? The naughty but often pretty ironer, who, after forty, disappears no one knows whither; the plain seamstress of whom the children in the house are afraid; the lady of the charcuterie, too, who tosses her paper-thin slices of ham into the scales, not without a certain coquetry. A woman should be clean for herself as much as others. Her head, covered by fashion with powder and pomade, should be brushed clean every day, her hair should fall gracefully, and not spoil her clothes, and make them unfit to be seen, which sometimes happens when they are put on. Her neck should symbolize the cleanliness of the rest of her person. She shouldn’t neglect to wash her feet and she should have as a maxim that the part of her clothing the most exposed to the dirt of the street should be the cleanest. Frequent baths are good for the health, even in winter; water should be her element and partial ablutions during the day, even the night, to give her skin pearly whiteness. Thus all her attire will bear that particular charm signifying that it covers an attractive body. Fashion is woman's literature. Dress is the expression of her personal style. By dress she conveys the outward expression of her taste, her skill, and aesthetic individuality. Dress is the highest of arts, the art containing all others. It is her palette, her poem, her theatrical setting, her song of triumph. It has been said of women that they are like coins, stamped with the image and superscription of love, which are useless when the stamp is effaced. Can we not imagine what care these living medals take of their surface, how they polish and keep them intact long after nature begins to depreciate them? Women of good style rightly affect for the street a modest and quiet dress of soft and dark materials, distinguished only by the impalpable elegance of cut. The grand Parisienne cannot hope to escape from a sort of democratic uniform. She can only be distinguished from the crowd by the faultlessness of her dress, and the subtle difference of style from the cheap warehouses patronized by the bourgeoisie. The modern woman is thus in some degree like a book bound à la Jansémiste, that is, with a plain undecorated cover at first sight, but upon closer examination delicately tooled with lovely or curious subtle designs. The right bank is a sort of heptarchy whose kingdoms are l'Etoile, Batignolles, Montmartre, La Chapelle, Belleville, La Nation, and l’Opera. The left bank has a much cooler and more peaceful character. The women who live on the left bank are quieter and more conventional. One feels that the lady of the left bank is proud of her quarter, that she rightly considers herself as part of the aristocracy it contains, the aristocracy of race, science, literature, and art. She shows sometimes to the point of exaggeration that she is! The noble Faubourg Saint-Germain extends from the Invalides to St Germain des Prés on the one side, and from the Quai Voltaire and the Quai d’Orsay to the Luxembourg on the other. The Parisiennes who live in this circle are none of them free from haughtiness, and give themselves an air of social and oral superiority when they mention their address to folk on the opposite bank. The Montrougiennes and the Vaugirardaises are the last to assimilate the feelings and impulses of the capital. The scene in Paris changes gradually, like a kaleidoscope. At Bastille are the little business bourgeoisies, girl clerks, accountants, florists, polishers, lace workers, dyers, saleswomen making for the Caire-Petits Carreaux quarter. Farther, near Hotel de Ville, you have a whole medley of needy mediocrity. Take an oblique line north towards Boulevard Sebastopol and we meet the noisy population of markets, women belonging to various trades. On nearing the Palais Royal there is a complete transformation in the type and physiognomy of the passerby. They become well dressed, even smart. Dressmakers, girls attended by maids going to the Louvre, or their music lessons, young married women to shop or amusements, foreign visitors armed with their Baedekers, dancers going to rehearsals, all gloved and correctly dressed in well fitting clothes crossing the bridges towards either the Bon Marché or the Opéra. Ascending the Champs-Elysees towards the Place de l'Etoile, we see the lady on horseback, bicyclist, soubrette, the demi-mondaine, the neurasthenic woman, and among these last is the Englishwoman. While all this world is walking up and down the great avenue, in the roadway are carriages drawn by thoroughbred horses bearing pretty demi mondaines, exquisite under fresh powder, on their way to Bois de Boulougne. What tired looking women one sees through the carriage window, what worn and lined faces enervated by idleness. To seem bored is the fashion, to seem interested in anything would be bad form. To be seen and to shine, this is the existence of these brilliant butterflies, who by constantly endeavoring to idealize themselves, have ceased to be women- their hearts beat no longer under the stiff bodices, the blood does not circulate under the smooth white skins, their slender bodies do not seem made for maternity, and real passion would break them like reeds. Scarcely a third of the women in Paris are Parisiennes by right of birth. A woman may be Parisian by taste and instinct anywhere on French soil, and indeed in any town or country in the world. In every class of society, a woman is a hundred times more feminine in Paris than in any other city of the world. The Paris girl would rather go without meat than her 'petit noir' (coffee). The paradise of Paris, that paradise so much celebrated, envied, admired and coveted by our own provinces and by the whole world, is a deceptive mirage for those unfortunate creatures who must struggle to live there. Paris, for the majority of Parisians who live and die in its luxury, its gaiety, its noise, its feverish ambitions, is a fearful prison of pleasure, of desires, of artificial intoxications, of social and worldly vanities, where dissipation, excess, and debauchery make up the penal servitude on its inhabitants. It has been said of the Parisian woman that she has the beauté du diable, but it has not been said that she has the characteristics of the damned, tortured, heroic victims of the self-indulgence of others, of the capricious pleasure and vanity of men. In this study of the Parisienne, we shall be able to observe her struggle against countless difficulties, her strength so often rising superior to her weakness; her hidden life in this hell which wears the outward appearance of a Garden of Eden, but is nevertheless, for her, a Garden of Torture. Click here to download The Modern Parisienne. Aw, I'm glad you enjoyed it. It explained a lot of things about Paris and French people that I didn't understand before! Yes, I feel the exact same way! Actually in the introduction the Baroness kind of pokes fun at how he seems so disgusted by men oppressing women, yet he is just as guilty as the rest of them... in the last chapter though there are some remarkably feminist comments laced in with his completely sexist ones. Like, he says women artists are emptyheaded, only women authors have brains, and he attacks the education system at the time for females, saying it turned them into people useless for anything except childbearing... I just laughed at some of those parts. Edith Wharton's essay "French Ways and their Meaning" is also interesting. I hadn't read that one, thanks for the recommendation! How strange that, as I read this post, I am sitting beside the pool at a Las Vegas resort. Much of that last paragraph could be directly applied, without revision, to everything and everyone I see around me. The one difference is that here and now, it is more democratic between genders - there are many men here that I believe are in their own Garden of Torture, as much as any woman present. I think that Paris is the same way these days. If I go visit my friends at Stalingrad or Jaures there are all these refugees who can't get their papers and they sit around hoping someone will come along with an odd job, meanwhile their family is left in their home countries and they're so worried. Even people who are employed struggle so much just to get by, I never realized how low salaries were here until recently. The city is hard on everybody.